Not content to kill Link in 104 ways in Ocarina of Time, YouTuber MasterOfHyrule returns for another round of senseless deaths, this time in the simply to-die-for Majora's Mask. 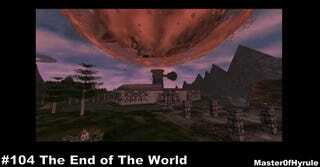 I found death so prevalent in The Legend of Zelda: Majora's Mask that I never actually finished the game. Well, it was a combination of the death and breaking up with the girl with the Nintendo 64. Either way the end result is my editor-in-chief being very disappointed with me every time I mention it. Bah, let's just die and get it over with.